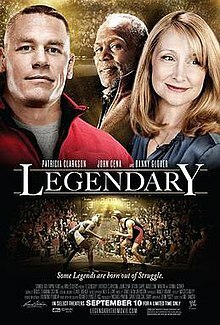 Legendary is a 2010 drama film directed by Mel Damski. The film stars Devon Graye as a high school wrestler, in a cast that features John Cena, Patricia Clarkson, Danny Glover, Madeleine Martin, and Tyler Posey. The film was released on September 10, 2010. A sequel to the film was announced on the 25th of April 2018 scheduled to be released this fall. After being bullied, book-smart (but not street-wise) teenager Cal Chetley (Devon Graye), joins his Oklahoma high school's wrestling team, seeing it also as a way to reunite with his estranged and wayward brother, Mike (John Cena). His mother, Sharon (Patricia Clarkson), is not initially supportive of Cal's decision, especially when she discovers that Mike is secretly coaching Cal after she gets a call from Mike Chetley's jail cell. She has been away and without contact of her older son, Mike, for over 10 years, but copes and watches yet another family male become legendary. WWE Studios produced the film alongside Samuel Goldwyn Films. Filming took place at Bonnabel Magnet Academy High School in Kenner, Louisiana in December 2009. The orchestral score, written, and composed by James A Johnston, is available on iTunes. The film was released on Blu-ray and DVD on September 28, 2010. The DVD is being sold exclusively at Walmart and the Blu-ray exclusively at Best Buy. Critics received the film poorly. On review aggregator website Rotten Tomatoes, the film holds an approval rating of 19% based on 43 reviews, and an average rating of 4.8/10. The website's critical consensus reads, "Maudlin, predictable, and clichéd, Legendary pins its talented cast under a heavy layer of formulaic schmaltz." On Metacritic, the film has a weighted average score of 39 out of 100, based on 17 critics, indicating "generally unfavorable reviews". Legendary failed to make the top ten at the box office in its only weekend in wide release, finishing with $200,393 in total. ^ Yard Baker web site (Fox Sports). This page was last edited on 16 June 2018, at 13:56 (UTC).